Panama equals a big canal = big dollars and an inconvenient gap in the Panamerican Highway between Panama and Colombia. This was more or less our idea of Panama before we arrived. Now, as we are slowly making our way by sea from Panama to Colombia, we have seen quite a different and diverse Panama. 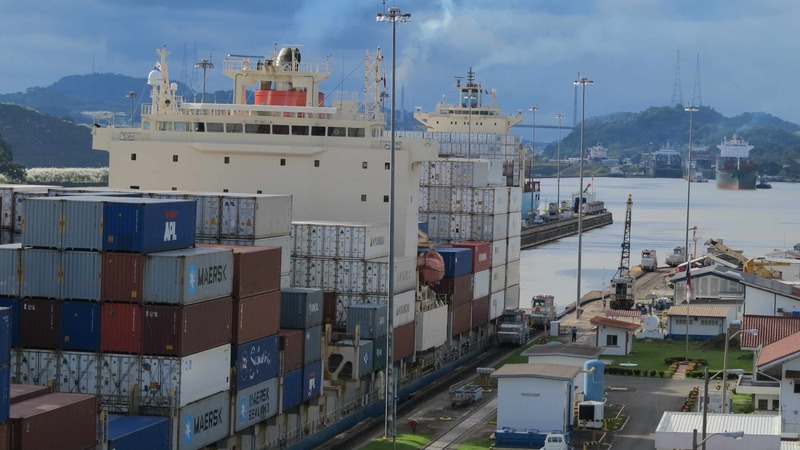 We arrived in Panama on 1 October after an unusual border crossing. In Costa Rica, the last part of the road to the Panamanian border was a dirt road with almost no traffic and absolutely no traffic signs. So we had to ask our way and even then we were in doubt if this could really be the right way to the international border between Costa Rica and Panama. It was the right way. Then we arrived at the border and started looking for the official buildings. The first office we managed to find was the Panama customs ‘shack’, which we recognized from a couple of foreigners in the doorway and the word ADUANA painted in tumbling blue letters on the door step. We will put a full description of this border crossing on the blog later, but to make a long story short, it initially looked like this should be our fastest border crossing so far. In 30 minutes we had dealt with the Costa Rican immigration and customs, we had finished the Panama immigration and we had the obligatory Panama car insurance in our hands. Only remaining obstacle was the Panama customs for the temporary import of the car…and this turned out to be an almost surreal experience. The lady in the customs office was infinitely disappointed that we had actually managed to get all the required paperwork ready before her office closed. She was sighing deeply and making it very clear to us how extremely inconvenient this was. Then she placed herself in front of the computer and started typing our data into the required form. The software however, would not accept the data she entered. Again and again it came up with a message that data were incorrectly entered. When Marco tried to help, the lady said: Ha!! Now the IT expert arrived! In the mean time she was trying to copy the text from one of the drop-down menus in the software and she was so distracted that half of the time she grabbed her mobile phone instead of the mouse. At one point, she took her mobile phone and we thought she was going to call for assistance, but no, she was just putting on some salsa music and started dancing with her male assistant. We were speechless. In the end, she took one of the old paper forms and stated that this handwritten form would be absolutely fine and would not create any problems for us, as it was the form they used to fill out before getting the new software. Of course she was wrong but we could not do anything about it at the time. It was already past closing time and the lady promised that she would enter our data into the system tomorrow. When we left the border we were very upset and very nervous for how this would affect our paperwork for the shipment to Colombia (fortunately it took only a few hours at customs in Panama City to correct the papers). It was already getting late and we were too far from the city where we had planned to go to sleep so we had to find a private property along the road where they would allow us to stay. When just entering a new country we always find that it is a bit tricky to find a good place to sleep for the first night. All countries are different and you need to get the feeling for the place. But this time we were very lucky. When entering a small valley, we saw a beautiful and large property below. It looked like a small piece of Norway in Panama with nice wooden houses and a very well kept lawn with a small lake. We decided to try our luck and entered through the gates. At first nobody was there, not even a single “perro bravo” but after walking around for a bit we met a young man who took us to the owner, a Swiss/Panamanian guy who was down by the horse stables (and which horse stables!). He let us stay the night for free. We were delighted! In the morning the hungry geese woke us up and we enjoyed our breakfast there while the ranch slowly came to life, the geese and the ducks had their breakfast and morning swim in the lake, the old guard dog came to pee on Frida (no no no no!!!) and people went to work in the surrounding gardens and fields. We could have stayed for a couple of days more! 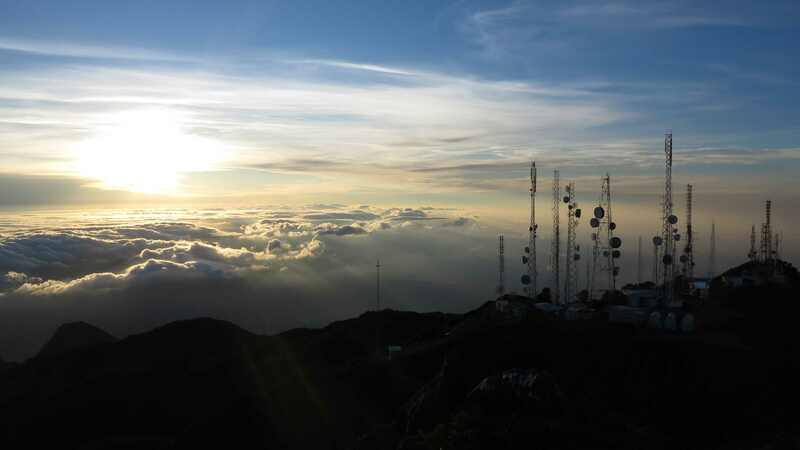 The next day we set our course for the town of Boquete and Volcan Baru, the highest point in Panama. First however, we found a place with free WiFi connection (fortunately it was just outside a bakery with nice cookies) and we booked two spaces on a guided climb of Aconcagua, Argentina, 6965 m high and the highest mountain in the Americas! So we were top motivated when we finally arrived at the start of the trail to Volcan Baru! We parked at the small ticket office at the beginning of the trail to Volcan Baru, slept a few hours, and at 1 o’clock in the morning we woke up and started walking to the top. The path is very easy to follow and winds its way to the summit for around 12 km with a total elevation gain of about 1700 m. We arrived at the top at 5 am, one hour before sunrise, so we crawled into our big down jackets and slumbered a bit while the stars slowly faded and the sun rose behind the satellite antennas. From Volcan Baru we drove north towards the Caribbean Coast and the islands of Bocas del Toro. We had booked 2 nights in a luxury jungle lodge and were very excited. We had planned to sleep in Almirante, the small port town from where we had to catch the boat to the islands the next day. But when we arrived to Almirante we were forced to change our plans. From the beautiful, rich and fertile Panama we had just left, we had now arrived to a dirty, chaotic and dangerous Panama. Just outside Almirante we saw people living in shacks around garbage dumps and inside Almirante there was garbage and poverty everywhere. We saw nobody with a face we could trust and when we finally went to the police station to ask if we could stay overnight outside the 24-hour station, the police officer basically told us that if we were to try to sleep outside (in our car) in Almirante we were bound to finish in a bad way! That was a clear message so we continued north along the coast to the town of Changuinola where we were finally allowed to sleep in the secure parking lot of a golf/recreational park of Chiquita (yes, the bananas). We were relieved! Changuinola is big on bananas. Banana plantations surround the city as far as the eye can see and Chiquita is the main employer. The guys at the recreational club told us that yes, Almirante is extremely dangerous and there is a big mafia there related to the container shipment of bananas. In Changuinola on the other hand, there is a lot of jobs in the banana business with Chiquita so people have jobs and money and consequently it is a quieter and safer place. The next morning we were still counting “uno, dos, tres, cuatro” when we left the recreational club and the morning aerobics class to go to our luxury jungle lodge! We were crossing our fingers that it would be as nice as the web page promised! It is hard to say what was the best thing about La Loma Jungle Lodge: Our secluded jungle cabin, the delicious fresh food, the great hosts Henry and Margaret or the friendly and skilled staff who cooked, took us on trips, caught us a live tarantula and answered all our questions about their culture, their land, their ancient beliefs and the surrounding nature. 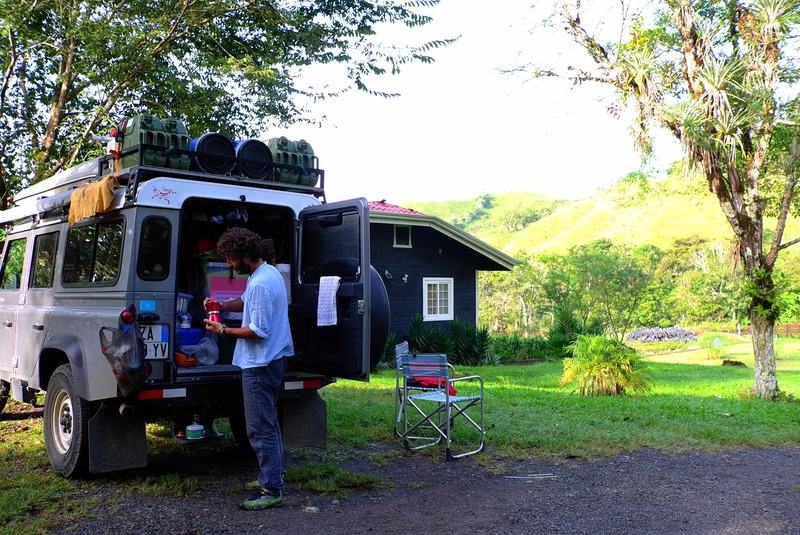 We stayed only two nights but the experience was so intense that at the end of our stay we left with a little bit of Loma inside and it felt like we were saying goodbye to good friends and to a home away from home in Panama. 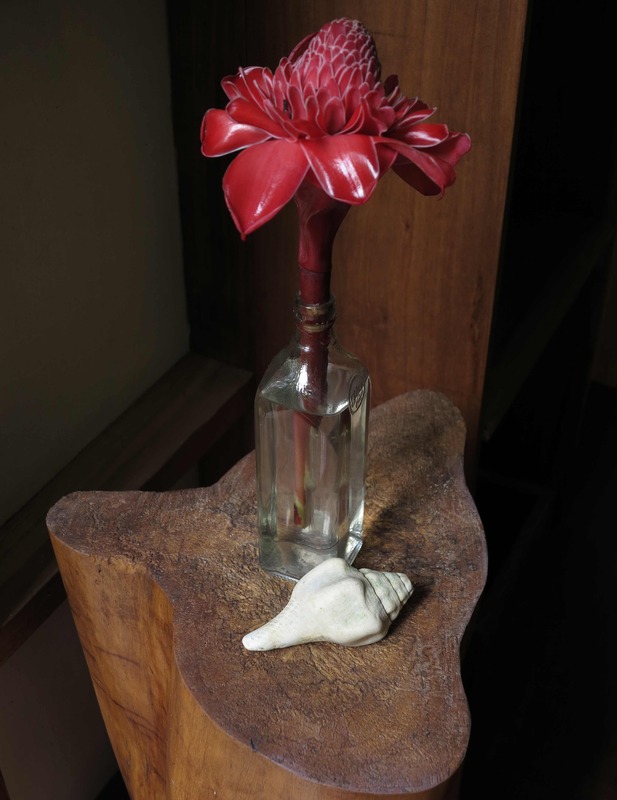 The Loma Lodge is located on an island in the Bocas Del Toro bay but far from the night life action of the main islands. You arrive by boat, first from Almirante to Bocas and then La Loma picks you up in their own boat to take you to the Bastimentos island. 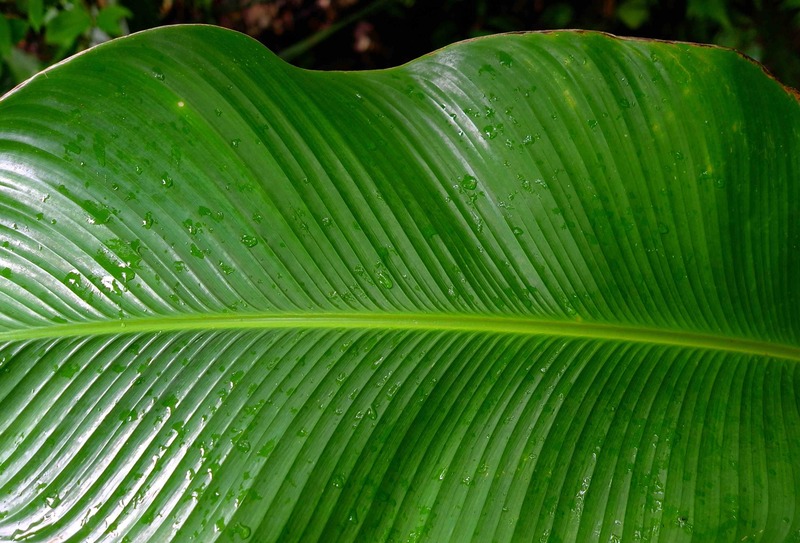 The lodge is located on a beautiful property surrounded by jungle and a small cacao farm. There is a central cabin where you find the kitchen and the dining area and then there are 4 guest cabins which are located up the hill, each cabin providing absolute privacy and a magnificent view over the jungle and to the water in the bay below. First of all, our cabin. Imagine a beautiful wooden floor, raised on pillars above the jungle floor, with a roof but without walls, like a tree house in the jungle but a luxury version of a tree house with every detail pleasing the senses. Not elaborate, but a simple minimalistic luxury. 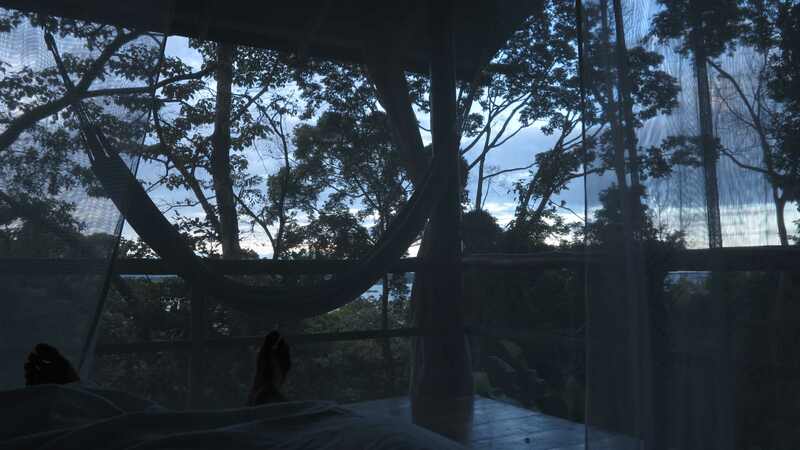 Imagine the sensation of lying in the hammocks in the dark tropical night, the jungle all surrounding you with its strong sounds of the cicadas, the birds, the night monkeys, the wind rustling the palm leaves. After a delicious dinner and a couple of Henry’s cocktails we would crawl into bed, only a mosquito net separating us from the jungle outside, the fresh sweet air sweeping through the room. And in the early morning we would wake up just as the dark night slowly turned into pale bluish dawn and we could start to distinguish the dark silhouettes of the trees and the shimmering light of the water below. After slumbering a bit more, we would fetch the tray with hot coffee and muffins which was brought up to each cabin in the early morning. And then a hot open-air shower before making our way down for breakfast. Waking up in the jungle lodge. During the day, we went around to see the cocoa farm, we went canoeing around the mangrove islands in the bay and we went up the nearby creek to the bat cave! 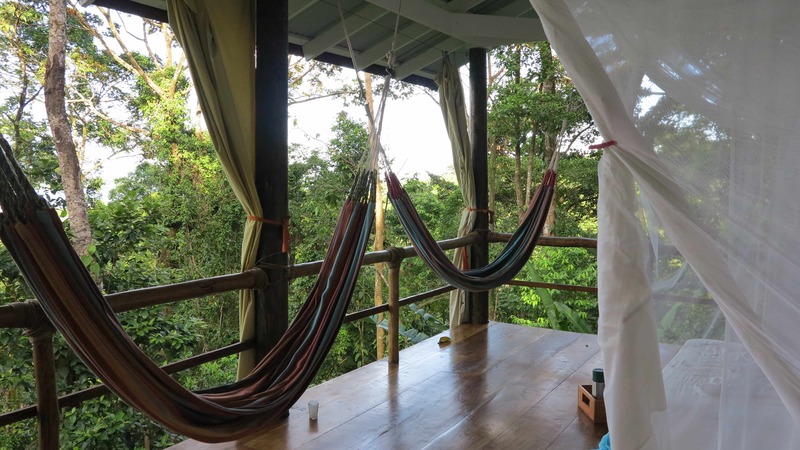 If it had not been the rainy season, we would have gone snorkeling in the National Marine Park but instead we had time to do the best thing of all, that is to do absolutely nothing but just lie around in our hammocks in the cabin, looking out over the jungle. Thank you to Henry and Maggy for inventing La Loma!